We recently supported the Blue Moon Walk, a five-mile charity walk to raise funds for the Teenage Cancer Trust. Proceeds go towards a new Teenage Cancer Unit at Addenbrooke’s Hospital, which is the centre for children’s cancer in East Anglia. 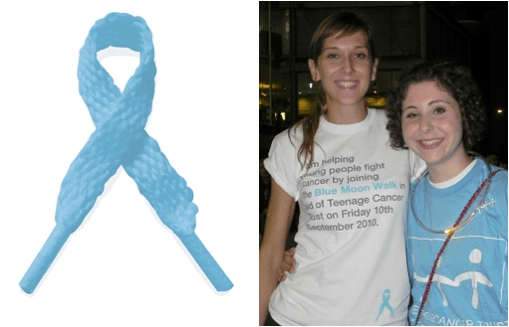 The Blue Moon Walk was spearheaded by 15 year-old Rosie Van Raalte, who in 2008 was diagnosed with primary bone cancer. Although Rosie has the all clear now, she wanted to do something to raise awareness and help other teenagers who are diagnosed with cancer. We helped Rosie by designing a recognisable and engaging identity for the event, which was then applied to all promotional collateral. Pictured from left to right: The Click’s Client Director, Fiona Smillie (who participated in the walk) and Rosie Van Raalt.